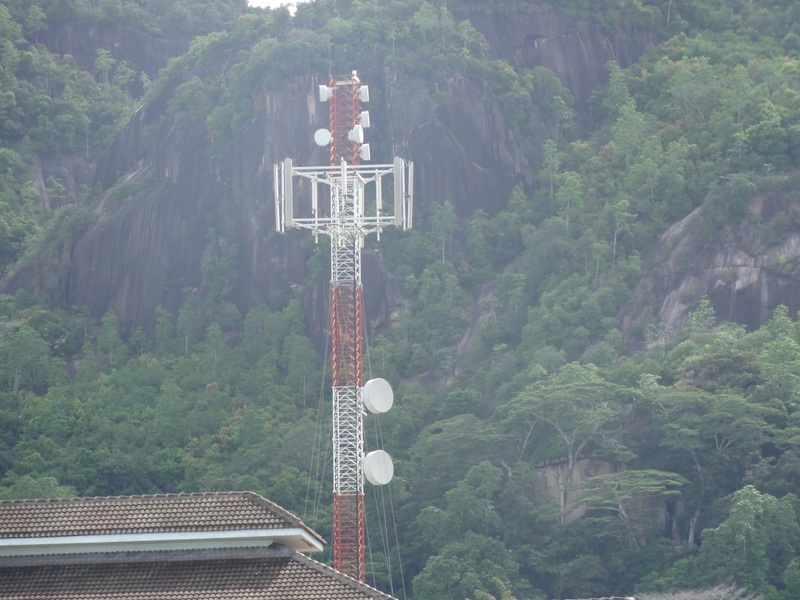 During the planning stages of an 8 turbine wind farm in the Republic of Seychelles, concerns were raised by the Public Utilities Corporation (PUC) over the potential for the wind turbines to interfere with their wireless microwave links. In order to address these concerns the wind farm developer, Masdar Power, commissioned Pager Power to investigate the PUC’s concerns by undertaking technical analysis and a communications survey. 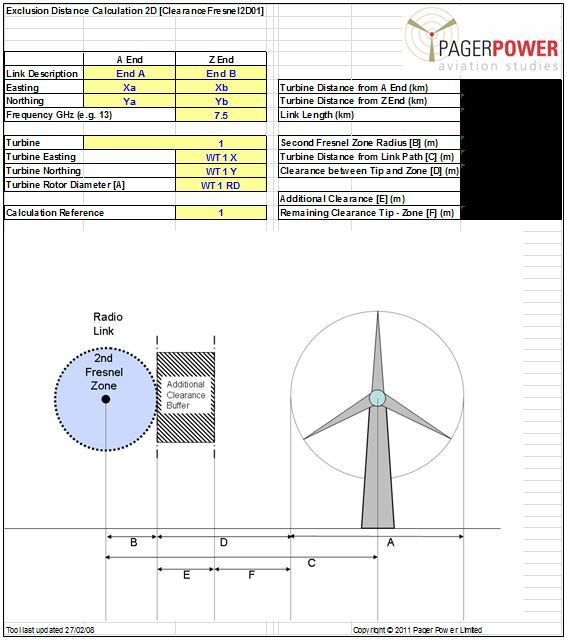 Pager Power’s results assisted in resolving the PUC’s concerns providing information to optimise the wind farm layout to minimise the effects on the microwave links and avoid planning delays. The project is now constructed and operational as of June 2013. Three of the 8 wind turbines can be seen in the image below. 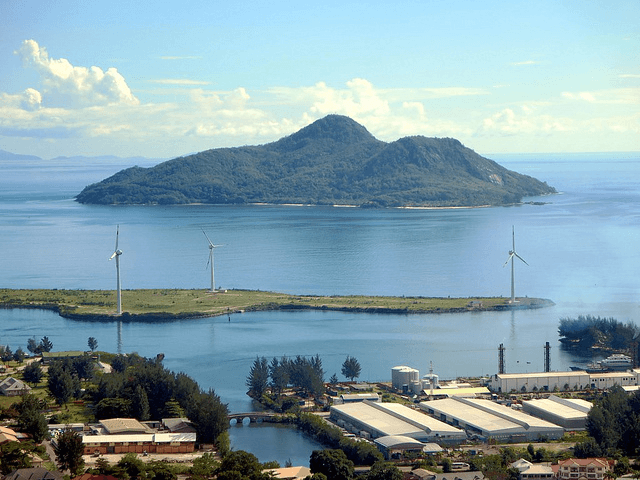 The 8 turbine development, hereafter referred to as the Port Victoria Wind Farm, was to be the first large-scale renewable energy project in the Republic of Seychelles. 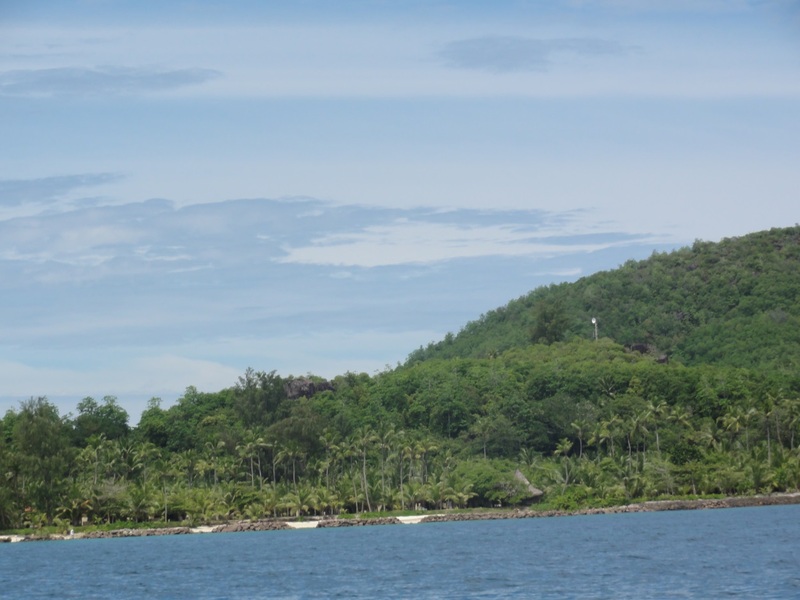 The 750kW turbines were to be distributed on two small islands off the coast of Mahé. However, during the planning process the PUC raised concerns about potential interference to wireless microwave communication links in the area. Needing to know more about these concerns the wind farm developer, Masdar Power commissioned Pager Power Ltd to carry out a Desk Based Communication Links Report, which was then followed up by a Communication Links Survey. Although we had undertaken work in many countries this was our first project in Seychelles. There was limited mapping and other available information for Seychelles. The survey of the microwave link ends was in remote and non-accessible locations. Some of the link ends were sited amongst thick vegetation, making them challenging to access as can be seen in the image below. In the first instance we identified which effects could have been caused by the proposed wind turbines. 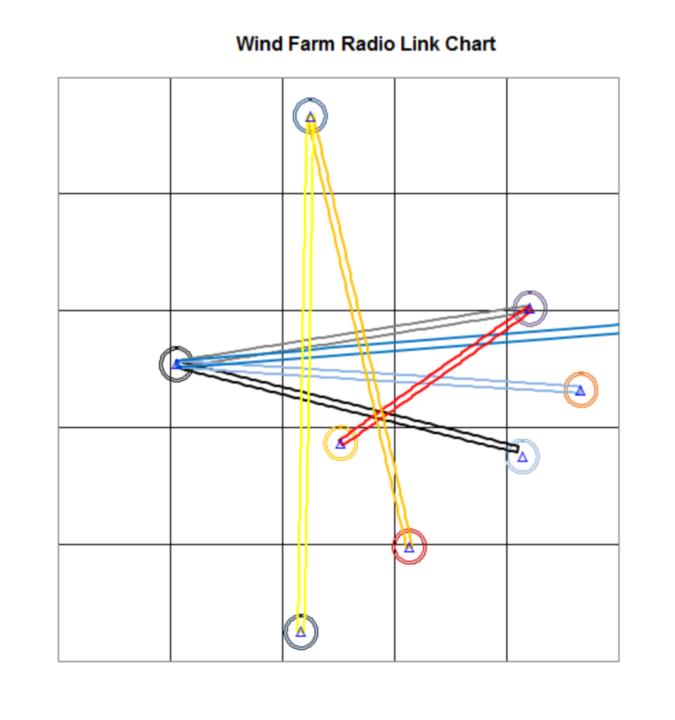 We used the provided link end coordinates along with the wind turbine layout to create a 2 dimensional (2D) exclusion zone chart (figure 4 below). The exclusion zone chart highlighted which of the planned turbines could have affected the microwave links. Due to the distances from the microwave antennae, diffraction effects on the link paths appear to be the main potential effect. The next step was to undertake 2D clearance calculations for the specific links and turbines where interference could occur. An example for Wind Turbine 1 (WT1) is shown in figure 5 below. 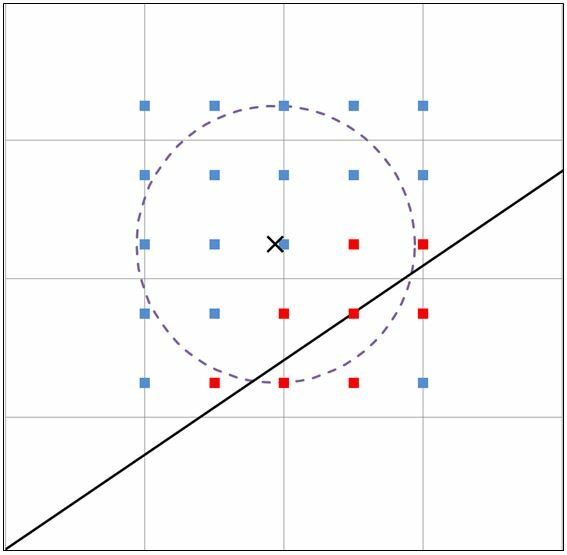 However, due to potential interference that was identified it was decided to undertake 3 dimensional (3D) clearance calculations. Confirm the coordinates of the microwave link ends. Following the completion of the link survey, the 2D exclusion zone calculations were then repeated based on the new coordinate data and 3D analysis was undertaken. Using the 2D modelling, the survey results and the 3D modelling, we were able to conclude that all planned wind turbines were unlikely to affect the microwave links. Furthermore, micrositing modelling was undertaken, for locations within 100m of the planned turbine locations in all directions, in order to identify suitable locations for turbine micrositing (figure 6). The Pager Power results were accepted by the PUC and the wind farm was given the go ahead. The 8 turbines went on to be constructed and the Port Victoria wind farm became operational in June 2013. The PUC has now taken over ownership of the project and during the first year of operation, it was reported that the wind farm was producing enough electricity to supply the intended 2,200 homes. Image accreditation: “Ste Annes Island” by David Stanley / CC BY 2.0 / Image resized and shape altered.